What the hell did we even do to piss them off so much back in Heortland, anyway? We sure as hell haven't done anything to them since arriving in the Pass. Healing seems to prioritize weaponthanes, so this lets us get our weaponthane levels back to normal AND heals a few wounded farmers while we're at it. I build the Stone Wall before we piss away all our goods on shiny objects/peace proposals doomed to failure/shits and giggles. The game is quite vague on what individual fortifications do, but they all seem to help. Considering the technology level of Glorlantha, you'd expect most kids to die of some sort of disease before reaching adulthood anyway. Cheer up, Jorator! 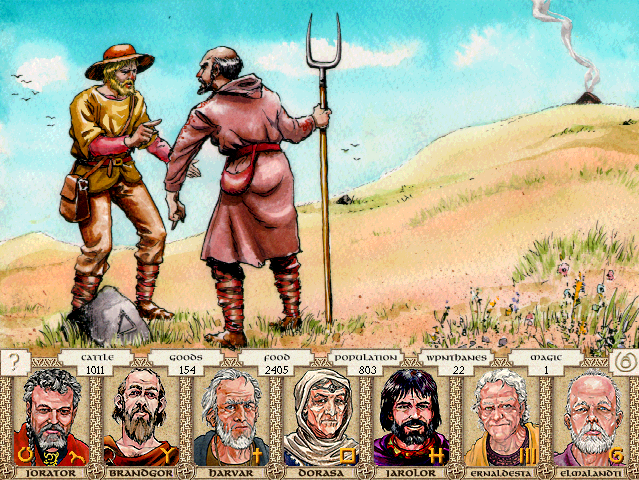 Orendal, a small stead-holder, accuses Baranthos, his neighbor from the Undaroli clan, of moving the boundary stones between their pastures. 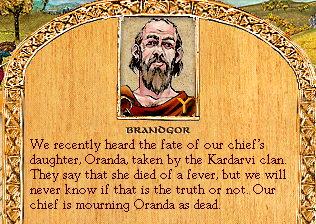 Baranthos denies this, and complains that Orendal is trying to use the clan chief to steal from him. 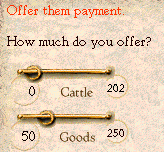 -Offer Baranthos a cow if he drops his claim. -Send an emissary to the Undaroli. -Tell Orendal to drop his claim. -Tell them to resolve the dispute by arm-wrestling. -Threaten Baranthos if he doesn't drop his claim. It is difficult to say for certain, but something tells me that Orendal's claim is unjust. Our men might be willing to fight against tough odds, but not for the sake of a few misplaced boundary stones. 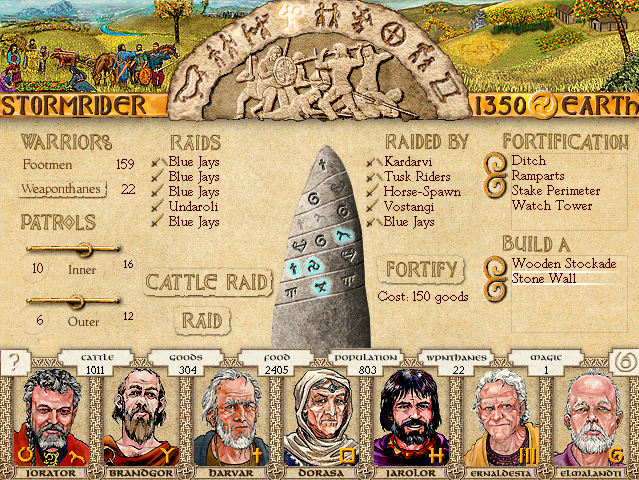 The amount of pasture in question means much to Baranthos and Orendal, but means little to the prosperity of each clan. There is much personal animosity in this dispute. Each party is more interested in being proved right than in winning clear title to the land. Perhaps there is another way for the two men to compete.